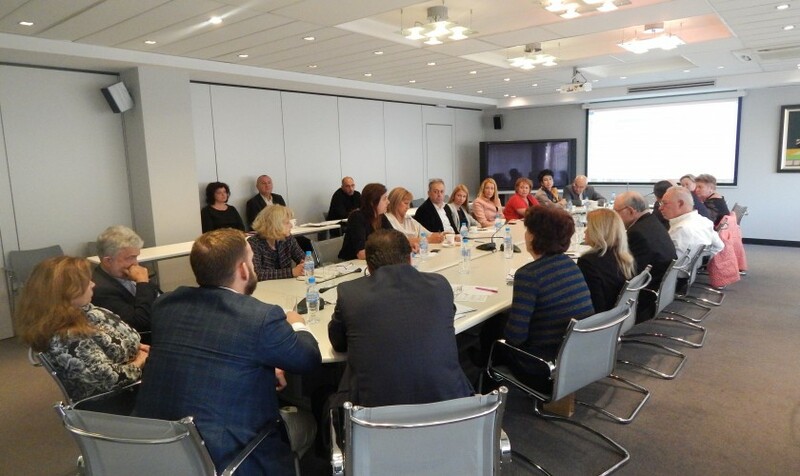 Sector organizations from the food and beverage industry met with the management of BIA and discussed current problems. The meeting was hosted by the chairman of BIA, Radosvet Radev. The aim of the meeting was to identify opportunities for joint actions to solve specific problems of the different economic sectors. Representatives of the Food Drink Bulgaria Association (Svetla Lesova - Chairman of the Management Board, and Iana Ivanova - Executive Director), of the National Branch Union of Bakeries and Confectioners (Mariana Kukusheva - Chairman of the Board), the Oilseed Oil Producers in Bulgaria Association (Mrs. Mariana Cholakova - Executive Director), the Bulgarian Soft Drinks Assosiation (Jana Velichkova - Executive Director), the Association of Meat Processors in Bulgaria (Dr. Svetla Chamova - Executive Director), the Union of Bulgarian Miller and the Union of Rise Producers (Mrs. Savina Vlahova, Chairman), the Union of Processors of Fruit and Vegetables (Stoyko Kirovski - Chairman of the Management Board and Antoaneta Bozhinova - Executive Director), the Union of Brewers in Bulgaria (Ivana Radomirova - Executive Director) and the Union of Sugar and Sugar Products Producers (Georgi Uzunov - Chairman of the Management Board). 1. The need for a comprehensive, in-depth sectoral analysis to outline the problems and opportunities for the food and beverage industry. 2. Adopt a new Food Law. 3. The application of a so-called circular economy for which we still lack sufficient information and initiatives. There are serious problems with the new European legislation on the recycling of plastic packaging. 4. Adopt a clear procedure for prior coordination of draft trade agreements between the European Union and third countries so that the interests of Bulgarian producers and traders are protected. An example was given - the agreement with Ukraine, which put the Bulgarian producers of vegetable oil and oil products, sugar and confectionery products and honey in an unfavorable market position. Sector organizations demand a thorough preliminary assessment of the impact of trade agreements and, on this basis, form the official Bulgarian position at EU level. In this process, consultations with business representatives should be key and decisive. 5. Introduce differentiated VAT rates for food. According to industry organizations, such a measure will have a positive impact on both producers and consumers, and on the Fiscal, as it is practically working against the high level of gray economy in the sector. Bulgaria is one of the four countries in the EU where there is no differentiated rate for food, and in many countries like UK, Ireland and Malta, VAT on food is 0%. The dialogue on the subject should precede the EU-currently reformed VAT reform. 6. The draft legislative changes on the so-called "dual food standards" was defined as a rather populist, pre-election theme rather than an attempt to solve a real problem. The proposed bills only place an imposing administrative burden on food producers and importers without any real benefit to society.